Dul Madoba (Somali: Dul Madooba) is a hill ridge 40 kilometres (25 mi) southeast of Burao in northwestern Somalia. It was also the location of a famous battle. 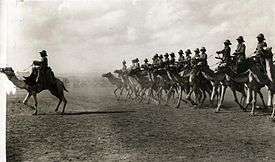 The battle took place on 4 August 1913 between the 110 members of the Camel Constabulary of British Somaliland commanded by Colonel Richard Corfield (reduced to 85 by the start of battle) and some 2750 well-armed Dervish followers of Mohammed Abdullah Hassan, nicknamed by the British as the Mad Mullah. Thirty-six of the Constabulary including Corfield were killed in action and 21 were wounded. Many of the Dervish were also killed or wounded. As a result of the action the British withdrew their protection of the local Somali clans in the area around the port of Berbera, but the Mullah was unable to follow up his advantage immediately.